St. Paul, Minn., June 15, 2016 – PolyMet Mining Corp. TSX: POM; NYSE MKT: PLM – today reported that it has filed its financial results for the three months ended April 30, 2016. PolyMet controls 100 percent of the development-stage NorthMet copper-nickel-precious metals ore body and the nearby Erie Plant, located near Hoyt Lakes in the established mining district of the Mesabi Iron Range in northeastern Minnesota. “Since completion of the state’s adequacy determination on the NorthMet Final Environmental Impact Statement in March, PolyMet is transforming from the extensive environmental review process into completion of permitting, financing, construction and operation of the Project,” stated PolyMet president and CEO Jon Cherry. “We are working diligently to prepare permit applications to ensure that they include additional information beyond what is required in the Final EIS and are complete, accurate and consistent with the Final EIS. We plan to submit these permit applications in the coming weeks,” Cherry concluded. On March 3, 2016, the state determined that the NorthMet Final EIS addresses the objectives defined in the EIS scoping review, meets procedural requirements, and responds appropriately to public comments. The 30-day period allowed by law to challenge the state’s decision passed without any legal challenge being filed. The Final EIS demonstrates that the NorthMet Project can be constructed and operated in compliance with environmental and human health standards. On April 19, 2016, the DNR, in partnership with the Pollution Control Agency and the Department of Health, held a Pre-application Public Informational Meeting that included an overview of the NorthMet Project and the permit to mine process together with a summary of other state permits such as tailings dam safety, water quality, air quality, and wetlands, that will be required to construct and operate the project. The DNR laid out the process for the permit to mine, comprising: pre-application consultation; submission of formal applications that will be posted on the project website (http://polymet.mn.gov); formal regulatory review; publication of draft permit with an opportunity for public comment; and issuance of permits. The pre-application consultation is underway and is intended to ensure permit applications are in order to expedite the review process. The DNR stated that the timeline for completion will be better defined once it has received the formal applications..
On June 2, 2016 the Company agreed to issue up to an additional $14.0 million secured debentures to Glencore AG, a wholly owned subsidiary of Glencore plc, to fund permitting and general corporate purposes, subject to the Company and Glencore agreeing to an Interim Financing Plan that addresses repayment of the outstanding debentures. The debentures are on similar terms as the existing non-convertible senior secured Tranche F-J Debentures. Loss for the three months ended April 30, 2016, was $2.352 million compared with $3.558 million for the prior year period. 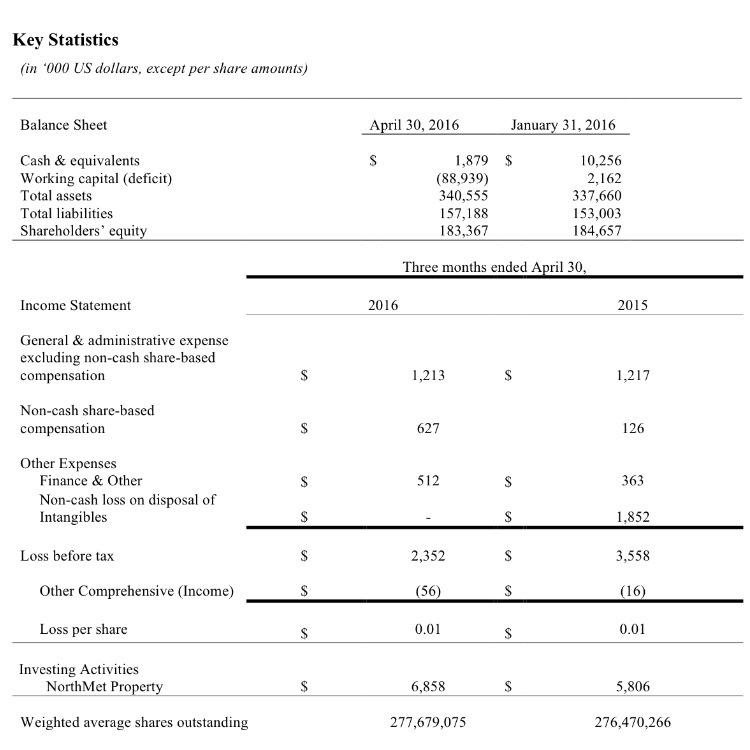 General and administrative expenses for the three months ended April 30, 2016, excluding non-cash share-based compensation, were $1.213 million compared with $1.217 million for the prior year period. Other expenses were $0.512 million compared with $2.215 million for the prior year period, which included a one-time non-cash loss of $1.852 million on the disposal of wetland credit intangibles. At April 30, 2016, the Company had cash of $1.879 million compared with $10.256 million at January 31, 2016. Subsequent to April 30, 2016 the Company received $3.000 million with the issuance of the Tranche K Debenture. At April 30, 2016 short-term debt totaled $37.442 million senior secured convertible debt and $49.840 million non-convertible debt, including $5.051 million due to the Iron Range Resources and Rehabilitation Board, secured by land that forms part of the proposed land exchange with the U.S. Forest Service. PolyMet invested $6.858 million cash into its NorthMet Project during the three months ended April 30, 2016, compared with $5.806 million in the prior year period. As of April 30, 2016, PolyMet had spent $107.651 million on environmental review and permitting, of which $101.200 million has been spent since the NorthMet Project moved from exploration to development stage. Completion of construction finance plan including commitment of debt prior to the issuance of permits but subject to typical conditions precedent such as receipt of key permits.